Most harp players who perform decide at some point that they need to amplify their instruments, so they go shopping for a pickup that will do the job. They soon discover a confusing array of options that can make it daunting to figure out what will give them good sound and be easy to use. We've gone through that process ourselves, spending a lot of time testing various pickups on the market. Since most were originally designed for guitars, it's not surprising that while they may sound OK on the harp, we found the results were never quite as good as we were hoping for. So Dusty Strings took some time to develop a pickup system specifically for their harps that would give the kind of sound they knew was possible. They call it the Harp Pickup. Using four carefully placed piezo pickup elements, the 30"-long Harp Pick-up achieves a clean, focused, natural, and lush sound. The rich, full bass notes balance and blend with the clear, musical mids and high notes. It's simply the sound of the harp, only bigger. This pickup works at any volume level, without feedback, which can be a concern with microphones when playing at extreme high volumes or with other instruments. 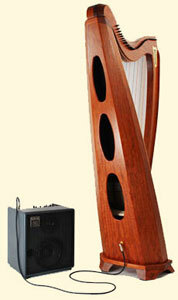 The four pickup elements are discreetly mounted inside the soundbox of the harp. All wiring is neatly bundled and run through a cable conduit that terminates at a single 1/4-inch jack that's flush-mounted in the back of the harp, making for true "plug and play" ease of use. Or if you prefer not to drill a hole in the back of your harp, you can use the specially designed Dusty Strings Jack Clamp to mount the 1/4-inch jack instead. A single guitar cable allows you to plug your harp straight into any amplifier and many PA systems with no preamp boxes or complicated connections. If you are playing in situations requiring very high volumes, you'll want to add a preamplifier to the system. In addition to boosting your signal, it will give you direct control over your volume and tone. With some amplifiers it will also sweeten and smooth out your sound. The price does NOT include installation. Amplifier and cable shown in photos not included. If you are very handy, you can install the pickup yourself. Installation involves attaching mounting clips to the internal braces of the harp, snapping the cable harness into the clips, gluing the elements in place with super glue, then drilling a hole (unless you are using a Dusty Strings Jack Clamp) and mounting the jack in the back of the harp. Complete installation instructions and gluing templates are included with the Harp Pickup. Don't want to drill a hole in your harp? Dusty Strings has solved this problem with their new, innovative Jack Clamp! There is an extra $100 installation fee if Dusty Strings (in Seattle, Washington) installs the pick-up in either a new or a used harp. This item ships directly from Dusty Strings in Seattle, Washington. To save money on shipping, order this item separately.